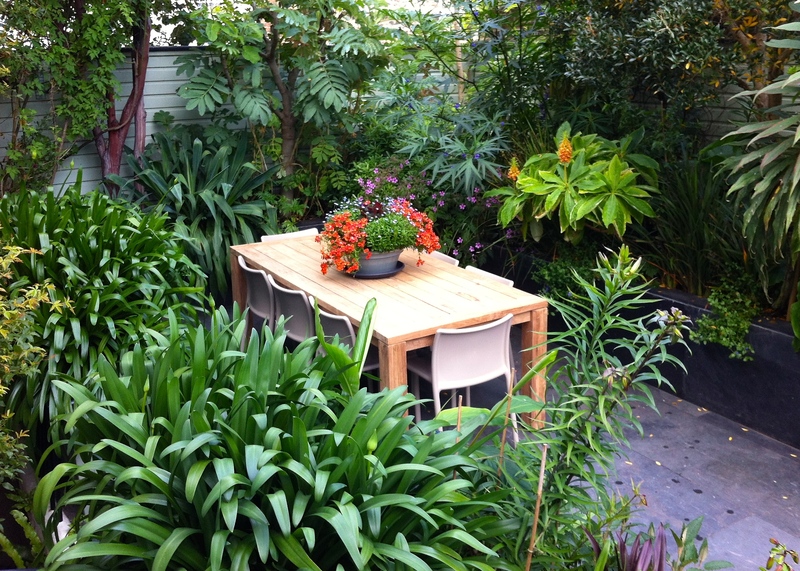 Our garden table in Broadstairs has always been graced by central pot or trough of flowers. We opt for hardy cyclamen or violas in winter, followed by narcissi and tulips in spring. These make way for begonias, coleus, felicia or petunias in summer and then the cycle begins again. There’s usually a fresh pot planted up and waiting in the wings so we don’t have an interval between shows. In a planting scheme that’s relatively fixed and predominantly green this has always been a nice way of introducing seasonal colour to the garden. It’s a feature I enjoy experimenting with and no two years are the same. Being a firm believer in ‘more is more’, I had never considered moss a suitable subject for this focal point, that is until I visited Restoration Hardware’s flagship store on Broadway in New York. Here, soft hummocks of moss were landscaped in iron or stone troughs and displayed on teak garden tables very similar to our own. In contrast to my pots of plenty, these simple containers made a restrained, elegant statement. With our garden becoming ever shadier, and a healthy covering of moss occupying the corrugated iron roof of the neighbouring garage, I think I should perhaps give moss cultivation a second thought. I am not sure I could sacrifice my beloved summer colour for a mattress of green, but through late autumn and winter moss might make a pleasant change. In spring I imagine the verdant landscape punctuated by snowdrops, Iris reticulata or miniature narcissi. 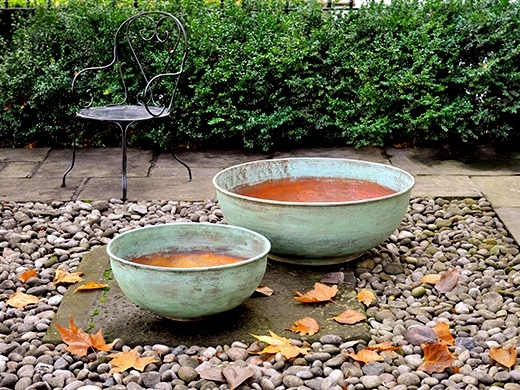 I have had my eye on the wares of a British company called Bronzino for a little while, and can imagine these copper basins gently mounded with soft green moss. I had better start next year’s Christmas list now! Whilst there are many types of moss, I believe the sort used by Japanese landscaping maestros such as Kasuyuki Ishihara is known as pincushion moss (Leucobryum glaucum), which prefers a sandy, acidic substrate and shade or dappled sunlight. Pincushion moss is extremely absorbent and varies in colour depending on how moist it is, but under drier conditions is an attractive pale green with a silvery-white cast to it. 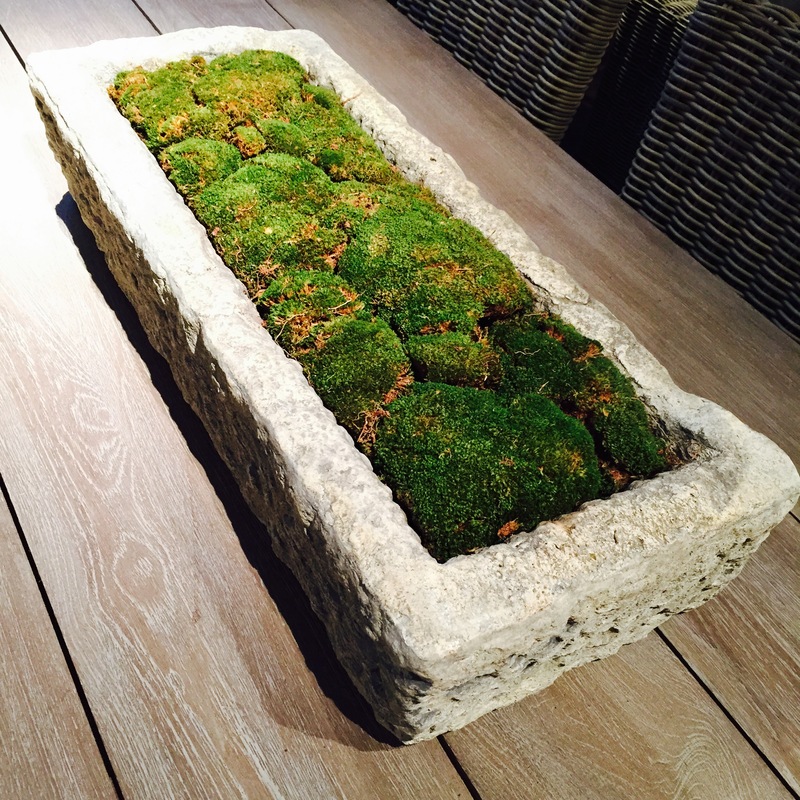 I have two reservations about creating a moss feature for my garden table. The first is that our resident blackbirds have an enormous appetite for picking the garage roof over looking for food, blocking guttering and littering the path with skid-inducing moss as they go. (Moss on slate is only slightly less dangerous than grapes on marble or banana skins on the pavement.) Second, despite being on the coast Broadstairs is particularly dry, meaning my display might look a little desiccated at times. Nevertheless I think next autumn I will take the plunge and create something marvellously mossy. In the meantime I will indulge myself in tracking down suitable containers. If you have experience of creating a moss feature in a pot or container I’d love to hear from you. Equally, if you know any good commercial sources of pincushion moss in the UK it would be great if you could leave details in a comment. A lovely idea, unfortunately moss gardening is not quite as easy as it appears. 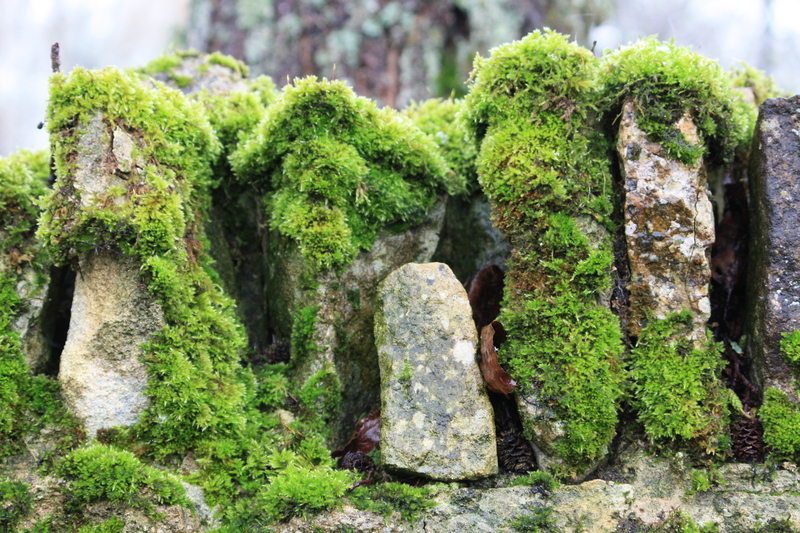 Suggest you start small with small shallow pot, a small amount of old potting compost (nothing too rich) and some stones or an interesting piece of wood, tuck it away in a damp corner and with luck moss will appear. The trick is keeping it moist all year round, although some species are more tolerant than others and most can be revived with a good soaking. It is OK to gather moss from your own garden but not from the wild. When collecting to transplant look carefully at where it’s growing and what it’s growing on, good clues as to how to replicate the conditions it requires. Mosses like lichens grow very slowly, so you will have to be patient. Do give it a try it is great fun and mosses are exquisite, but you have to get up close to really appreciate their beauty. I’m still experimenting and at one time had a “grand design” for a moss garden, failed miserably as it’s too dry here in the summer. So now I’m experimenting with small pots and lumps of wood in the dampest places I can find. Mosses will grow in a wide range of habitats on acid and alkaline substrates and as long as they receive moisture from the atmosphere they’re fine – hence your garage roof. Probably a good idea to start in your “home” garden so that you can check the watering during dry periods. I’ll watch for a progress report. We have a moss-like lichen in South Carolina that is commonly called British soldiers. If interested, you can see it in this post from Janaury 2014: http://marianstclair.wordpress.com/2014/02/25/weekend-escape/. Click on the photo for a closer view. The Cladonia cristatella is a frutose lichen and the red part makes spores. A bit off topic, I know, but it popped into my head. Moss lawns are a big thing here and they are beautiful and realitively easy to grow in our moist climate, but a bit of a chore to keep clean and free of weeds. My next-door neighbor has one and I have a peek of it from my kitchen window. Good luck. I look forward to reading more about your moss project. I love moss. I move it around on rocks, have planted it in shallow containers for fairy houses and used it as ground cover in containers. I will be interested to watch how and what you do. Exciting stuff. 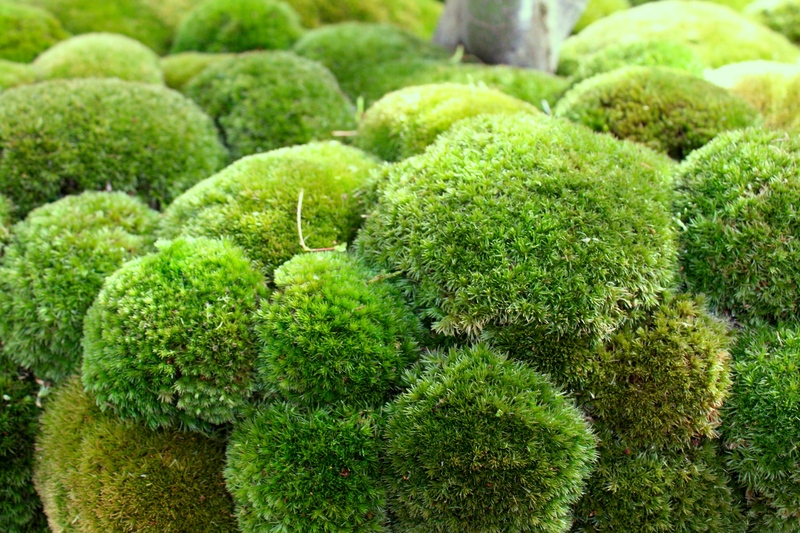 The easiest way to get mosses growing is a cup of plain yoghurt with about two tablespoons of moss that you have collected and a small amount water. Put this in a blender and then paint it onto a surface that you want the moss to grow on. This works for all mosses. If it’s pin cushion moss that you are after, then use damp, well rotted, ericaceous compost that is not too rich and fill a shallow container with this mix. Then just poor the yoghurt/moss slurry straight over the top and ensure it stays moist and shady. It’s best to start this around October, but you may have some success even this late in the year. There’s nothing else for it, you’ll just have to move back to the West Country! I love the idea of a moss feature especially with dwarf bulbs growing up through. If you can’t find pincushion moss, growing the ordinary stuff over pebbles creates a similar effect. Am rather taken with Marian’s idea of a moss lawn too. Especially as we are 75% there already! One day I’ll get back to the homeland! Yes, moss is one of those things that is quite happy to grow where you don’t want it and less inclined to oblige where you do. Lawns seem to be a favourite habitat. This morning we have a light sea mist and the garage roof is a wonderful bright emerald green. I must take a photo. I love photographing moss – it has such interesting texture and always a surprising reveal in macro. These pics of moss land are lovely. Thank you. I had fun at the weekend trying to photograph the moss on the garage roof. Limited success as we had a very thick sea mist, but it served to deposit millions of tiny water droplets over the tiny leaflets. Moss that grows in parking lot cracks is hardy stuff and might require less tending.